Low expectations can do a lot for a film. I walked into Limitless with the basic idea of a premise I found ridiculous. The fact of the matter is we do use all of our brain, not just 20% as one character states. This false premise unfortunately lowered my expectations so much that they had no where to go but up. Eddie Morra (Bradley Cooper) is a smart man who doesn’t have everything together, and can’t seem to get more than a few words into a novel he has already received an advance over. Life for Morra trends in a downward spiral culminating with his girlfriend, Lindy (Abbie Cornish), breaking up with him. Although, just when all hope is lost he runs into his ex-brother-in-law who gives him a pill that will seemingly unlock all of the potential hidden in Morra’s brain. Eddie is of course hesitant, especially due to the fact that the brother-in-law is a former drug dealer, and the pill may be nothing more than a hallucinogenic. Although, with nothing to lose, what do you do? Down the hatch it goes, and Eddie begins the change immdiately. While on the drug, NZT, the possibilities are “limitless”. Eddie even casually mentions that while on the drug he is the only person in the world with four digit IQ. He sees all the angles, picks up every new thing with ease, but unfortunately everything comes with a price. Eddie quickly rises, but finds out the drug has major side effects, and that if he runs out of the NZT he could die like many others before him. Eddie must use all of his wits to battle those around him, and find a way out of his predicament. Despite my initial misgivings against the premise, the entire idea becomes quite enthralling once laid out on film. You forget the little scientific faux pas, and instead concentrate on the charismatic Bradley Cooper and the intelligence and confidence his character emanates. Cooper is the person who sells the film, and if not for him it would have been a much weaker film. The performance proves that Cooper is leading man material, even if he hasn’t received a big hit since his breakout role in The Hangover. 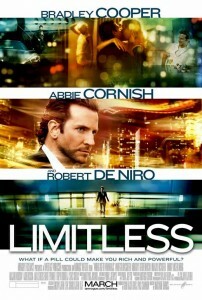 Luckily, the acting and the stylistic choices made by the team behind Limitless outweigh its interesting but light plot. The film grabs you from the beginning, and manages to entertain quite throughly throughout. The hardest thing about the film is deciding what you yourself would do in the possession of such a pill.